This photo was taken on November 3, 2016 at 4:27 PM. The location was in Silver Spring, Maryland about 3 blocks from where Taylor lives. The "Take it!" came from having driven by this tree many times, and thinking to myself, how in the world could this tree have gotten so ugly. So, on my way home from having had an epic meeting with Taylor, I decided to stop and take some photos of it to share with everyone. The After Take: Or in this instance the "During Take." While I was taking photos of the tree at this later in the afternoon timing, a fellow came out from a side yard that separates the houses that this tree stands near their curb. I asked if the tree was in front of his house? To which he responded, that it was in front of his neighbor's house. 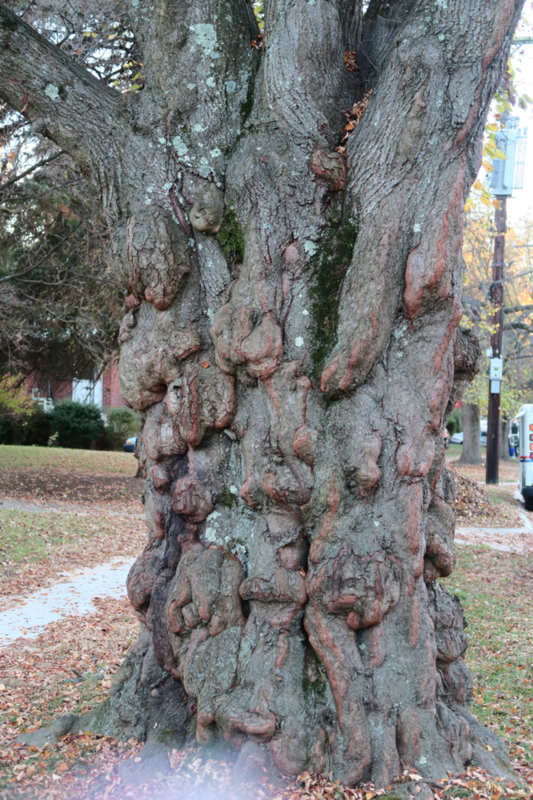 I said I wondered what could have happened to have it have such an ugly trunk. His ready answer was "stress." I thought about that for a moment and said I thought that was a very good answer. I then said that I thought that, stress had the same sort of uglifying effect on many things, including humans. He seemed to like my answer, and we fell into a conversation. He turned out to be a great guy, with us sharing several things in common. One of these commonalities was, each of us being the possessors of damaged or "bad" aorta heart valves. I had been through a change out of mine - and he is a candidate in waiting to have his done. Needless to say, it was a conversation that turned long and quite animated (mainly by me - as I am a long winded, hand and waving of arms gestulator - lol). We managed to break off the conversation and sort of agreed to see one at another time (The whole thing was big fun). Before leaving this photo and the above conversation - I have a few more things to add. I asked Ron if he thought that the folks that had the tree would let me have it - if I paid to have it cut down. He said he did not know, but thought there was a chance that they might be very interested in making such a deal. The reason for his thinking this way was that in the last couple of years when the tree grew its foliage in the spring - fewer and fewer leaves came out on the branches. He therefore thought that the tree might be dying. I am going to go back and see if I can talk with the owners of the tree and see if they will part with it as described above. I hope all of this comes through, as I can see lots of fun for us in the future if it does. I ask everyone to get ready for as they say, more to come. That has to be the most hideous tree I have ever seen. It may not be the prettiest tree but each one is a gift in its own way. I will say this, its very unique! It's the troll of the trees. I cannot help but wonder what made it grow like this. Wow....just wow! Our youngest didn't even recognize it as a tree. I would welcome its removal by you if that was in my yard.